Since I have been asked a couple of times, here is a second OOC thread. I figure we can just jump back and forth between them as the characters group and and separate. Someone could walk across to the building and use a window to get inside, right? Correct if I’m wrong, but the easiest way to get inside for an outsider would be to take the bridge, and than climb down to the first floor to go through the windows? - Greasy stuff: oil or whatever. Preferably something that is not too flammable. He wants to bring a few barrels, probably filled with water or something cheap. He might also want a few crates or wooden boxes. You can only easy reach 1 window directly from the bridge, which is small and barred. If you had something to stand on or could climb, you could get to the window above. The window above has a lock, but looks like it would be pretty easy to force open and climb through. The other windows around the warehouse would be pretty difficult to get to (you would need a grappling hook or a boat to stand on or something), but could similarly be broken into. Do you mean how many staircases? There is 1 staircase which goes from first floor (sea level) to second floor (access via bridge). There is a 2nd staircase which goes from second floor to third floor (accessed only from inside 2nd floor). The two staircases are right next to each other, but have a small flat landing where they connect on the second floor. There are no doors or anything attached to the staircases. They are wide and don't even have handrails or door frames; they have been designed to make carrying large objects between levels to be as easy as possible. I must not have explained things well. The warehouse is 3 floors. It has 2 intended ways to get inside: the first floor dock and the second floor bridge. Plus a number of windows. All easy enough to find with a little bit of shopping. First you have destroyed the woodcarver's shop, than agreed on this robbery of a deal (10 sk per day) and now this? Man, this way Acerbis will be ruined! Jokes aside, what is you plan Alex? As there are no ranged weapons, it changes the tactics a bit, I believe? Do you want to let them in and attack by surprise, just like the last time? Er, its 20sk a day. But yes, jokes aside, I think that I guess what Karl is up to. Ferran will assist in any way he can to booby trap the place at strategic places. Set trip wires at strategic places. Ferran is good at tying various knots that will come in handy. Cover with oil the 2nd from the top step of every staircase. Cover with oil every window case. Pouches of marbles (or any other round item) that can be used in a pinch to make a surface treacherous to step on. Some pouches filled with irritants (pepper, ash, flour, etc) used to blind/incapacite aggressors. Benedict wrote: But yes, jokes aside, I think that I guess what Karl is up to. 1) he does not expect to gain the element of surprise this time. They know their mates were ambushed the last time, so they will come in wary and prepared. Main idea: having a few chocke points so we can fight one on one. For the main door on the second floor, we place a few heavy crates or boxes behind it. Unless they have a ram, it is going to be tough going through this way. For the window that is easy to access, I propose to leave it as it is. If they break it, they can come in, but they will have to go one at a time and they are going to be easy picking for us. So we don't reinforce that window, but we nail a small plank to the window ledge on the inside. This plank will have some nails sticking out and we will paint the plank and the nails black. Also, we leave a plank about two feet by two feet with nails sticking out just below the window. Once again, we paint it black. For the other windows on the third floor, we are going to use some planks to nail them shut. Question for everyone: in case they come in through the waterfront on the first floor, should we wait for them on top of the staircase on the second floor or the third floor? Also, we are going to keep a few small barrels (filled with water?) on top of the stairs to throw them down. If we use a big plank like an old discarded door, could we cover up the top of one of the staircase? (we don't want to cover up all access because we want them to come in to get a beating, but is always good to have a back up plan). Karl wears his Gambeson (Torso, hips, pelvis, arms to the wrist), Open helm and he brings his Zweihander. The warehouses are almost empty, so he should enough space to swing that nice blade Also, he goes shopping for a piece of wood that is about the size and weight a Zweihander (well, it will be a bit lighter). He also pays to have a small wooden pommel. This is meant to be really crude: it is just a big piece of wood that Karl can swing. In case he does not want to use lethal force, he wants a big club that he can swing like a Sweihander and use his longsword proficiency with it. How can you post a drawing on the board? 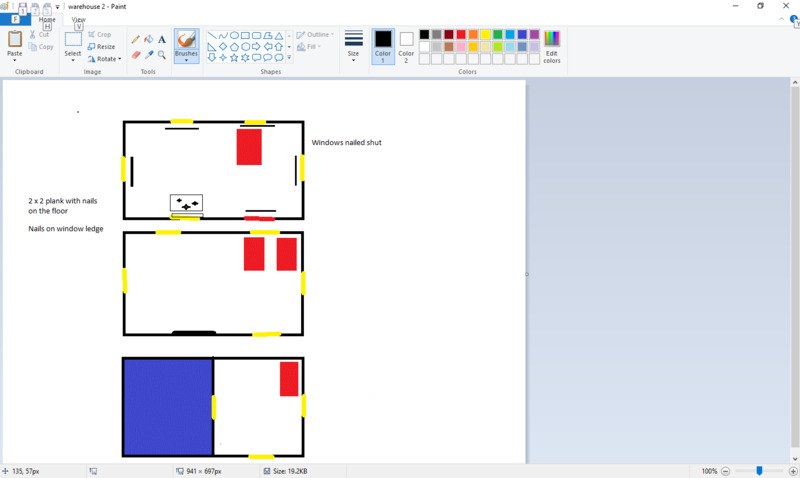 I did a quick sketch of the building with our traps, and I would update it as we put more traps. I suppose you need to upload the file to any image sharing site, or do a printscreen and use a site like snaggy or something. And just post the link created. Tx Korbel! I used snaggy and it worked easily. I'll update the picture as we put more trap. Maybe we should leave someone hidden on the second floor? To attack them from behind, or prevent from retreating. I don't think that would work: if they come in numbers, which Karl expects, they will be more careful. One person could be hiding on the second floor behind crates, but if they find that person, he is screwed: he will have to face the whole gang on his own. Better that we wait all on the third floor. I don't mind leaving one of the prisoner on the second floor. As long as this prisoner does not know much about her setup (ambush) on the third floor, it should be okay. He would be kind of a bait to tell the others that they are indeed at the right place. Where do you want to set up the trip wires? Any other ideas for traps? The Caltrops don't have to be next to the stairs, they just have to be close by. I agree that we should make the 3rd floor our battle ground. 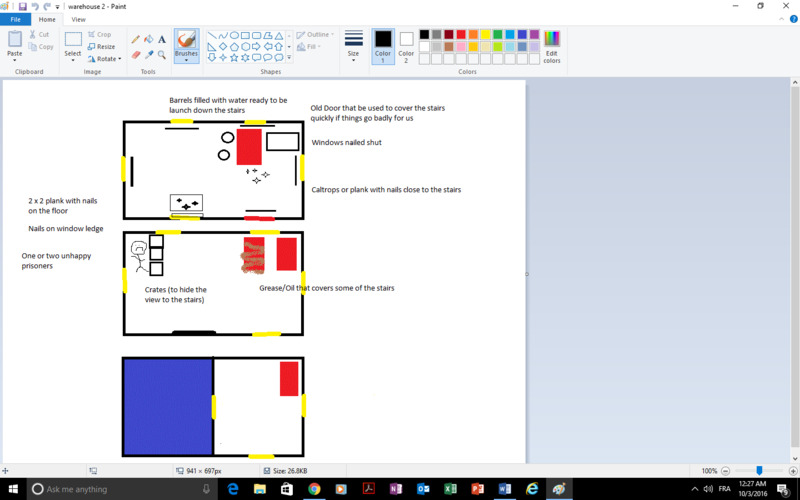 I have a better idea about trapping the 2nd floor tho, if we can have some extra stuff. A couple of hay bales. We will use most of the caltrops on the 2nd floor, then use the hay to conceal the traps. One will stay on the 2nd floor to goad them upwards. Ferran will do it if no one else wants to. We should use the 3rd floor staircase as a choke point, hitting them from every side, hurling irritants (pepper, ash, flour) to blind and disorient them, hazards (marbles and/or caltrops to step on), etc etc. We should plank every single window on the 2nd floor. On the 3rd floor we will plank every window that doesn't face the canal. The ones facing the canal will be our escape routes should things go bad. Window cases will also be trapped with grease, except the escape ones. All prisoners should stay with us, bound and gagged. Even if they don't know exactly what we have prepared they've seen us fight before and know how many we are. We shouldn't spoil the element of surprise and/or give them another fighting man. A final note. If we are to make it through the canal in case things go bad we should have a small boat ready for that. Apart from these notes, I'm in 1000% to what you already said. Benedict wrote: A couple of hay bales. We will use most of the caltrops on the 2nd floor, then use the hay to conceal the traps. One will stay on the 2nd floor to goad them upwards. Ferran will do it if no one else wants to. Benedict wrote: We should use the 3rd floor staircase as a choke point, hitting them from every side, hurling irritants (pepper, ash, flour) to blind and disorient them, hazards (marbles and/or caltrops to step on), etc etc. Benedict wrote: We should plank every single window on the 2nd floor. On the 3rd floor we will plank every window that doesn't face the canal. The ones facing the canal will be our escape routes should things go bad. Sure, although the windows on the second floor are already have bars. Benedict wrote: Trip wires. 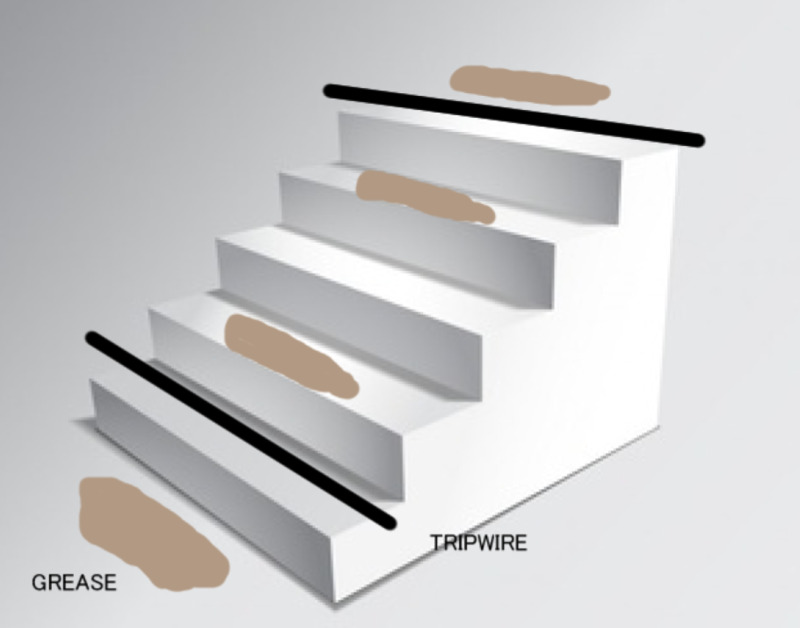 There should be two trip wires on every staircase, one at the bottom, the other at the top. Every tripwire will be between grease spots. The idea is that they will see the tripwires, but won't be expecting the greasy steps. Benedict wrote: All prisoners should stay with us, bound and gagged. Even if they don't know exactly what we have prepared they've seen us fight before and know how many we are. We shouldn't spoil the element of surprise and/or give them another fighting man. 33 you want to set up a new thread for the Ambush?